A Little Animal...A Tale of Three Elephants (a Baby, a Bull and a Mom) - a little adrift jr. 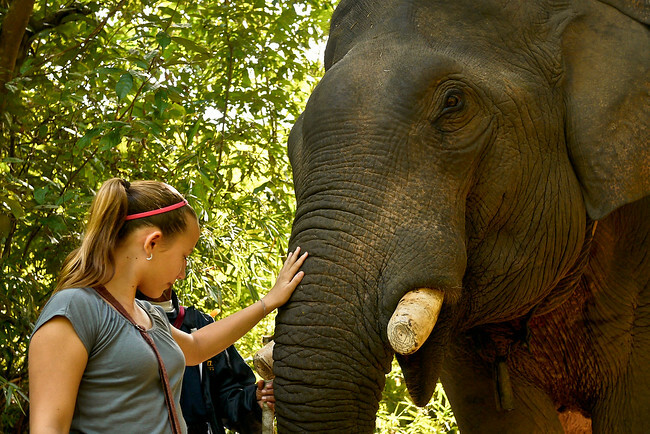 There are so many wonderful things we did while we traveled in Laos, and my favorite thing was seeing a two month old elephant with his mom, and I got to ride an elephant! Personally, I think it is wrong to keep such a big animals in captivity when they should be running around free and holding each others tails in their trunks, one behind the other. It’s sad, because sometimes they get abused and I learned that the female elephants don’t usually don’t have babies while they’re in captivity, and because of this, elephants are dying 15x faster than they are being born. 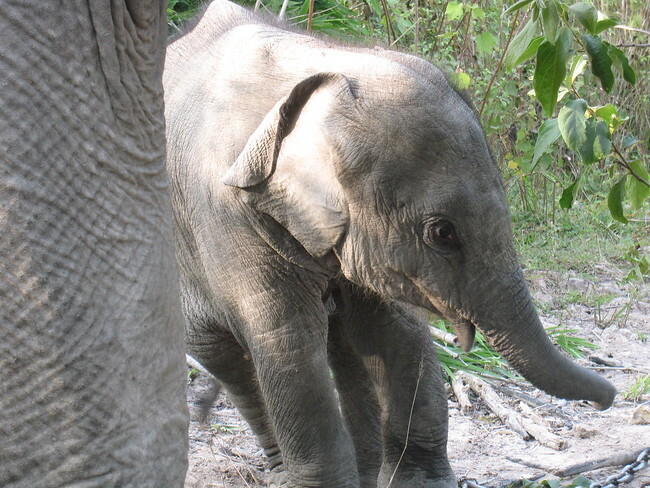 This is the two-month old elephant; he kept eating and playing with his mom--don't you just love his baby fuzz?! It makes me sad when I think about them being abused and always having to do whatever their mahout tells them to do; that’s what I noticed when I was riding the elephant; the elephant often stopped to grab a branch to eat and his mahout hit him with a pick in the face–I didn’t like that part of the elephant ride. It is amazing to now know what it’s like being on top of the biggest animal on land and seeing an amazing view from on top of his back–I just wish they would stop hurting the elephants in order for me to ride it. (Just so you know, movies and cartoons make elephants seem bigger than they actually are)! 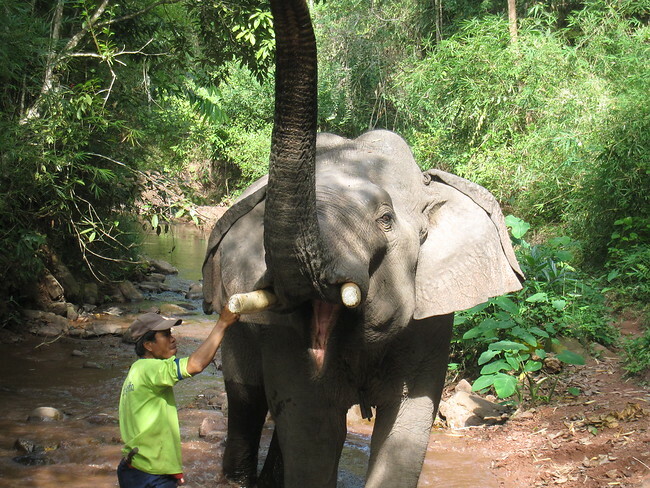 During our trek, our elephant kept pooping and man, it stunk so bad every time! One elephant turd was as big as 10 human turds and the elephant raised his tail every time, that’s how I knew it was coming. If you didn’t know, an elephant’s poop is green and firm because it eats so much fiber and leaves all day long. I took a video of it so you can see what it was like; I thought it was gross but kind of cool and our guide kept pointing out some of the elephant’s private parts to me and my aunt. I read a lot about elephants lately because I think it’s sad they are going extinct, and I hope that one day me, or someone else, can help change what is happening to them. In Laos, almost all the elephants log everyday of their lives and so when I was riding the elephant I was thinking to myself “I’m glad that I bought this elephant for the day so that he didn’t have to move heavy logs today…but, now he has to carry me on his back. In Thailand, it’s illegal to make elephants work in logging, but in Laos it isn’t illegal yet and there are so many elephants forced to log until the day they die. 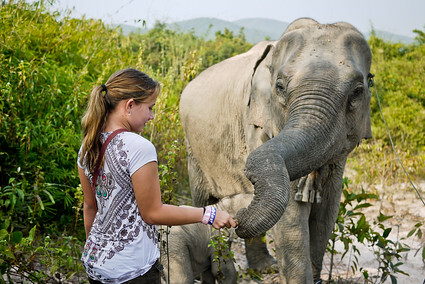 Enjoying getting to know our elephant on the trek. On a different day, I saw a baby elephant that was just two months old, and I was thinking of how rare that was because the elephant’s owners want the elephants working the whole time, not having babies. Mother elephants are pregnant for about 22 months so, it made me happy to know that for two years the mom elephant didn’t have to log! This is really cool because we only get nine months…and even though she had the baby elephant, the mom still looked pregnant. The tiny elephant was a boy, weighed about 200 pounds and had a bunch of baby hairs on his head and back. It made me think of a real baby when I saw him because human babies also don’t have very much hair and just have these thin little hairs on a bald head. It was the cutest thing ever. Another thing about elephants that really fascinates me, is its trunk. They use them for eating, picking things up, breathing, drinking and bathing. Did you know that there are about 100,000 muscles in an elephant’s trunk alone? Neither did I. 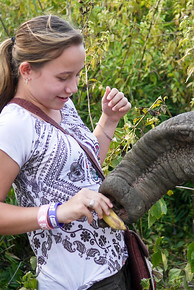 When I was feeding the mom elephant a banana she snatched it from me and ate all of it, even the disgusting skin! I’m glad we still have elephants, but they are endangered and so I hope my kids and my grandchildren get to see them too. I think if we all learned more about the elephants, we would have more sympathy for them. And with sympathy and affection we would know more about them and care about bringing back their population, and not letting them go endangered, like they are now. A Little Travel Video…Thailand’s Culture and Geography! They are really sweet creatures, and I agree with you, we need to make sure they are around for a long time to come! It would be really sad if they weren’t here during the next generation. You are such a lucky girl… Take it all in and enjoy every moment. Keep writing! It’s wonderful to see the world through your young eyes. I am enjoying every moment. I’m going to write as long as I can. I think so too – I enjoy seeing the world through your 11 years old eyes . Thank that you share you thoughts with us.